Established in 1959, the Plainfield Library may be small in size, but not in its importance to the community. Plainfield is a small, but mighty town full of citizens who are highly involved with the world around them, and the Library helps them stay engaged through a variety of services. One very important function it serves for Plainfield’s residents is as a gathering space for a wide variety of events. “It has become the hub of the community not only for our own activities, but for other groups who meet on a regular basis. 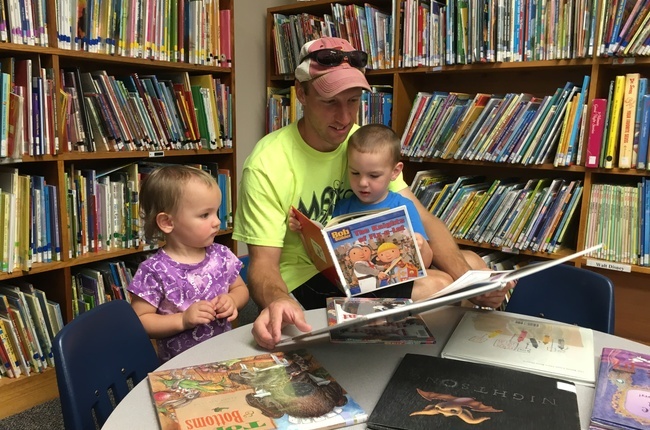 We are the smallest of the seven libraries in Bremer county, but not the smallest as far as activity,” said library director Clarence Bergman. Bergman goes on to list organizations such as Girl Scouts, Legion Auxiliary, and Women’s Club, to name a few, as groups who use the library’s space in addition to celebrations held there by residents of Plainfield. These groups depend upon the library to suit their needs. This is exactly why, in 2015, the Bremer County Community Foundation (BCCF) awarded a $3,000 grant to the library for its project to remodel the community room and kitchenette. The grant enabled the library to install new counter tops, purchase a larger refrigerator and upgrade its projector screen. The renovations have received praise. The Plainfield Library also received a $3,000 grant from the BCCF in 2014 for the upgrade of its computers and circulation and catalog management system. Bergman is thankful for the grant support which allows him to focus on more important work. “Without the grants, it would be a continuous fundraising activity for the library which would be another task that takes away from the operating and programming of the library,” said Bergman. A mission especially close to Bergman’s heart is providing literacy opportunities for all library patrons. Part of fulfilling this mission is the library’s annual summer reading program for area children. Last summer, the program focused on the 150th anniversary of Plainfield which gave local citizens the opportunity to teach children about the town’s past and celebrate its future. It is this kind of interaction that allows Bergman to direct the library’s activities to meet community needs. “All libraries are different because different communities want different things, we have to listen to and meet their needs. At the same time, we have to challenge them.” said Bergman. The Community Foundation partners with organizations like the Plainfield Library to ensure rural communities can offer the services they rely on and benefit from. With the help of generous donors, the Community Foundation has the ability to grant out funding to sustain their beloved organizations so they can focus on what’s important – creating a thriving community.